Forty-five years ago, on the first Earth Day, the United States had serious environmental problems. 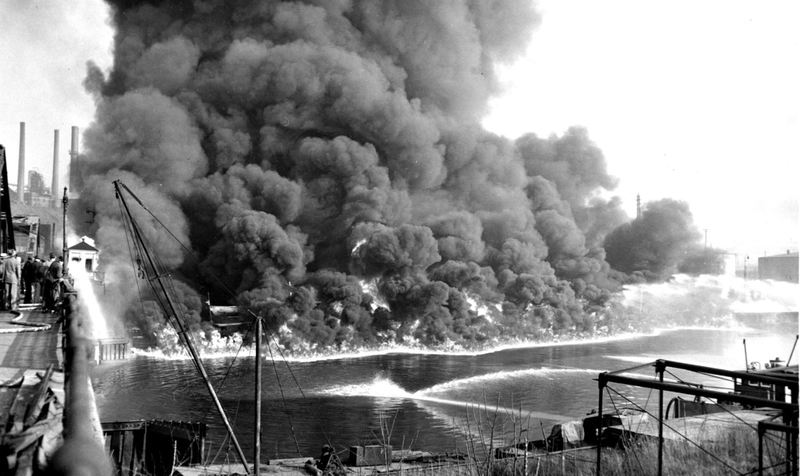 The air was increasingly dirty and, emblematic of our water pollution problems, the Cuyahoga River (above) in Ohio caught fire -- several times. Today, those problems are gone. 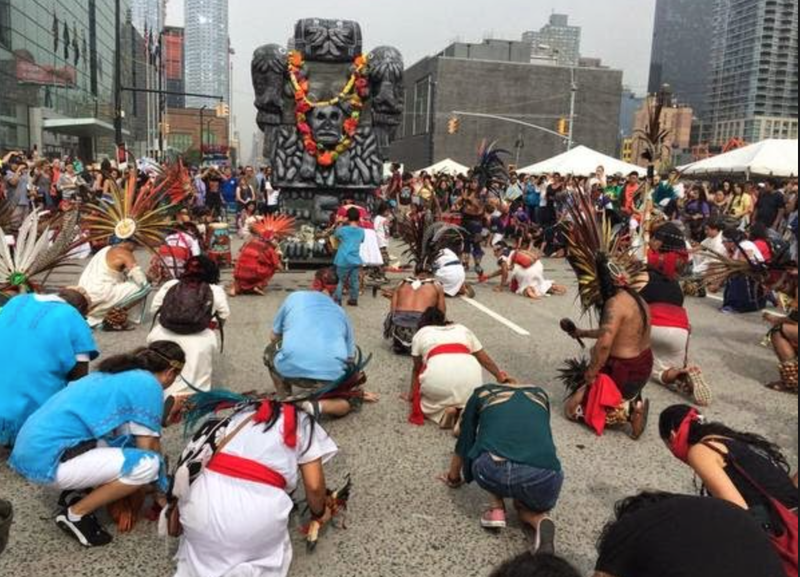 We have the original environmental movement to thank. But, rather than declaring a well-deserved victory and going on to more productive endeavors, Big Environment (now a multi-billion dollar industry) now has to hype global warming's dangers and attempts to intimidate (denier!!) those of us who realize the scientific support for their catastrophic global warming hypothesis has collapsed. After all, if the major environmental problems are solved, their gravy train is threatened. But, Big Environment has morphed into something more sinister than that. 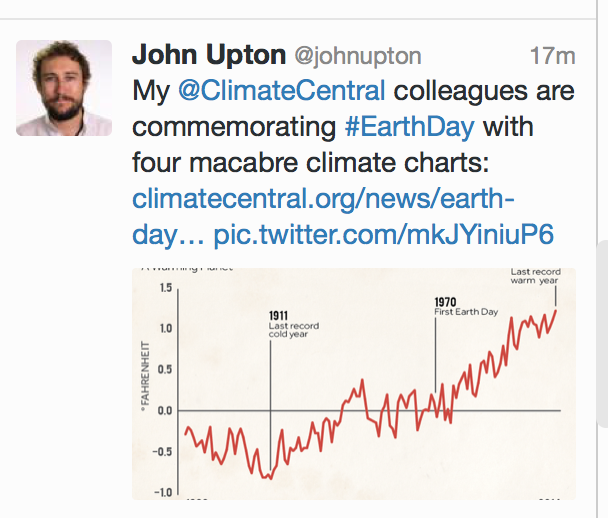 Climate Central, one of the hyping organizations, has been tweeting items all day and I want to reproduce a couple of them to demonstrate how silly, and even dangerous, this has become. Okay, let's look at world temperatures on the first Earth Day as shown above. 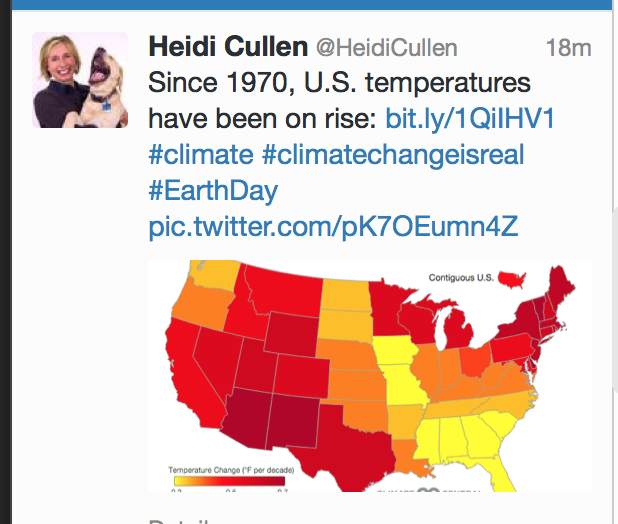 The rise in temperatures state-by-state (Heidi's map) or worldwide (John's chart above) is called "macabre." What an bizarre sentiment! Yes, mass starvation in 1970. 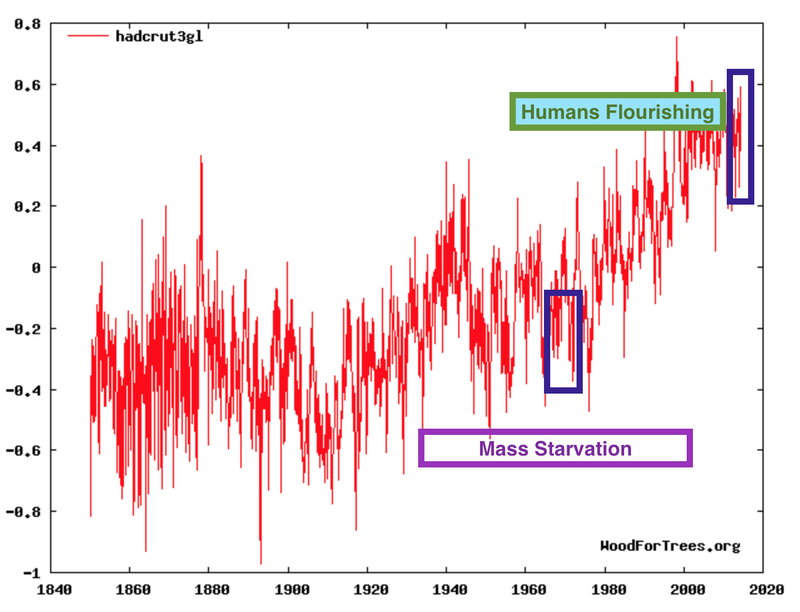 Droughts, frosts and climate other issues caused more than a million to starve to death. "The battle to feed all of humanity is over. In the 1970s hundreds of millions of people will starve to death in spite of any crash programs embarked upon now. At this late date nothing can prevent a substantial increase in the world death rate..."
Of course, the "hundreds of millions" of people starving to death never happened -- not even close. Why? Temperatures warmed; bringing with them longer growing seasons and Norman Borlaug's Green Revolution caused agricultural productivity to skyrocket. Rather than celebrate this tremendous achievement -- the saving of hundreds of millions of lives facilitated by warming temperatures -- Climate Central pronounces warmer weather to be "macabre." Let that sink in for a moment. movement where the "right-thinking" people (President Obama, Bill Nye, Al Gore, Leonardo DiCaprio, etc. etc.) fly around on private jets (the most carbon-intense form of travel) hectoring us to cut our carbon footprints! Big Environment criticizes and attempts to block third-world access to cheap energy (where it is desperately needed to lift people out of poverty) while their leading lights have carbon footprints the size of Montana. Hypocritical? Immoral? I'll let you judge. None of these will be solved by building wind turbines. Is there a reasonable way forward? Yes, some very smart people have put together a much more optimistic look at the future that will lift people out of poverty while protecting the environment. I urge you to take the time (5-7 minutes) to read it. I was very impressed. Meanwhile, Earth Day has continued long past its expiration date. It is a relic of the past. Let's have the 45th Earth Day be the last.